The sleek and clean looking Division 15" Laptop Backpack from Timbuk2 is designed to be a bag you use daily, transporting your 15" laptop and other essential gear to work or school. The large main compartment and interior organizer can fit books, lunch, a light jacket, and a host of smaller items. Your laptop rides shotgun in its own padded, zippered pocket that you can access from the rear. This design feature saves you from digging into the main area for your computer, and keeps it safe against your back when you're walking around. When you do need access to the main compartment, the Division can sit upright on a flat surface while you dig inside. Walking around with the Division is meant to be extremely comfortable, featuring external compression shoulder straps, a removable sternum strap, and a breathable airmesh back panel. The straps are meant to sit naturally on your shoulders, but if you don't want to sling it on your back, you can use the padded handle on top to carry it around. 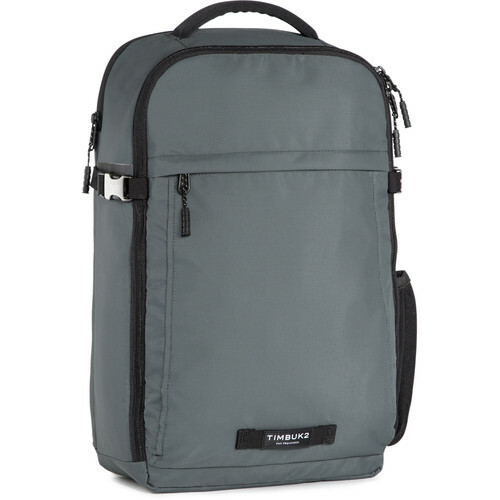 Division 15" Laptop Backpack (Surplus) is rated 4.3 out of 5 by 26. Rated 1 out of 5 by David from Every time I see the front pocket of this pack I get angry!! The front pocket on this backpack is so inaccessible that I literally want to rip my hair out. I'm typing this right now with one hand because my other hand is stuck in the front pocket. It's waayyyy to difficult to unzip because there is this annoying lip over the pocket, which I guess keeps rain out, but it also keeps my hand out. It's so hard to unzip completely. And then, once you unzip it, your items are so deep in the pocket that you can't reach them. And God forbid the backpack is full of stuff, as these items will push agains the pocket, trapping everything in it and forcing you to have the tactile strength of a rock climber just to rip out whatever is in the pocket. Rated 5 out of 5 by El Jefe from I like this backpack a lot! When I first saw the bag I was a little disappointed. It looked smaller than the backpack I was replacing and didn't seem that it was actually going to fit my laptop. But, not only is my laptop fine in there, but the bag is actually able to fit quite a bit of books and other items, like chargers, really well. Everything is snug in there, so there's little chance of things jostling around and getting broken as you move throughout the day. The only thing that I am still slightly disappointed with is the water bottle pocket on the side. But that is so minor and doesn't, in my mind, qualify for giving this backpack less than 5 stars. Rated 2 out of 5 by Felipe from Straps wear faster than pack I'm really disappointed in this pack which I've now owned for 13 months. Although the pack itself doesn't have any wear, the shoulder steps are worn through where the rubber coating meets the fabri on the strap. Very surprised given the usual quality of timbuk2. Rated 3 out of 5 by Wildkitten from Straps Slip I use this as my everyday bag to carry things to work. I find the straps slip a lot - I *have* to use the chest strap or the straps slip backwards, which is not a problem I've had with other backpacks. Also the chest strap is very high (I moved it to its lowest settings) and is uncomfortable.